Take our first example, The Excelsior (Soho WC2, fig. 37) at the top of Charing Cross Road. 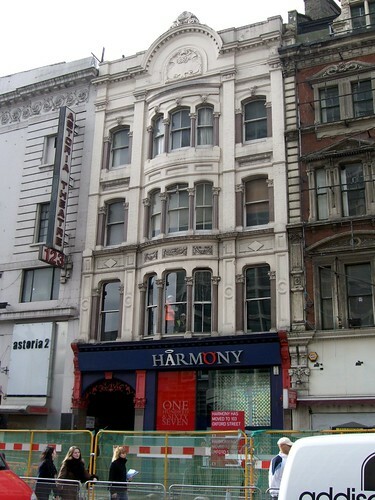 Putting aside the pane of glass which makes up most of its frontage, it’s just about possible to imagine the pub signage running above street level where now it says “Harmony”, and those boxy pillars framing a street-level window. There remains some rather nice ironwork around the discreet entranceway to Falconberg Court on the left, too, though when this was a pub, there would hardly have been any need for smokers to stand huddled under there. It hasn’t been a pub for a long time, probably not since the early part of the 20th century. In any case, it is now condemned, along with the Astoria Theatre it sits alongside, and indeed the rest of this city block, destined to become an enlarged Tottenham Court Road station as part of the vast new cross-London underground railway which has fetchingly been named Crossrail. Moving further south along the street, the provenance of what is now a rather bleak-looking restaurant called Scotch Steak Houses is more obvious, thanks to its prominent lettering (it was, as it proclaims, rebuilt as the Tam o’ Shanter, though was called the Palace Tavern after that, before closing as a pub in 1960). A building that’s less obviously a former pub, due to its extensive reconstruction, is The Rose and Crown (Soho WC2). 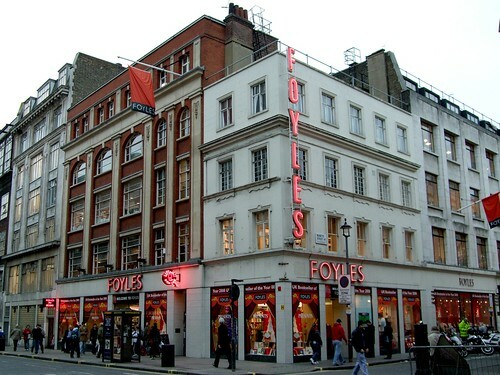 It has been part of Foyle’s since very early in the 20th century (Foyle’s moved to the road in 1906), and the interior has been completely gutted and integrated with the larger adjoining buildings (this was done around 1913).2 Its name comes simply from the names of the streets at the corner of which it sits: Crown Street and Rose Street. Its identity however, has been doubly erased, as the former is now Charing Cross Road and the latter Manette Street. Figure 38. 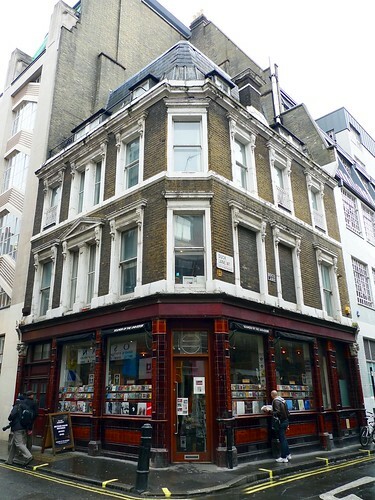 The Rose and Crown (Soho WC2), now Foyle’s bookshop. Returning to our starting point and turning left into Oxford Street, one quickly comes across a couple of buildings which, like almost every other on this street, have been completely remodelled at ground level and now present discount goods for undiscerning buyers, often with English language schools upstairs. The Primrose (Soho W1) is up first, less obvious and now more garish. Moving a few doors along, The Queen’s Head (Soho W1) gives itself away by featuring prominently its former identity (on the garret tower reads “1880 | Walton | Old Queen’s Head” — in other words, when the pub was rebuilt and the name of its publican at the time, William Walton). Figure 39. The Old Queen’s Head (Soho W1), now converted to a shop. Further along Oxford Street, few other former pub buildings survive (if any), certainly if the evidence of the spectacularly unattractively rebuilt Hog in the Pound (Mayfair W1) is anything to go by. Moving in from the borders, a number of buildings stick out. 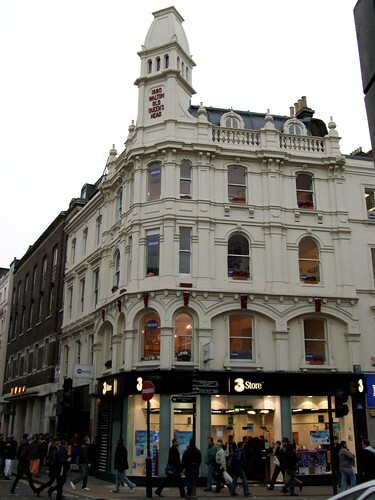 Still one of the most famous pubs in the area is The Intrepid Fox (Soho W1), on Wardour Street, which after several hundred years finally closed in 2006 amid much outcry,3 though it has since relocated to a new site behind Centre Point tower. Even now, the original building still remains in place, boarded up, surely making no profit for its owners who were so hasty to be rid of its occupants. Turning into Broadwick Street from Wardour, one quickly comes across another former pub building, now in use as a celebrated (and very fine) record shop called Sounds of the Universe. Back when this stretch was called Edward Street, this was The Bricklayers’ Arms (Soho W1). Unlike a lot of former pub buildings in the West End, the tiling on the pub’s facade hasn’t been painted over (or removed to be replaced by a new ground level), so it still shines out from the other buildings along this stretch of road — except that is, of course, the Blue Posts which sits on the very next corner. There’s certainly no shortage of pubs around here even now. Figure 40. The Bricklayers’ Arms (Soho W1), now a record shop. Turning up Berwick Street (away from the Blue Posts), there is a building on the corner now occupied by yet another prospective fast food chain franchise, and which was once The Crown and Apple Tree (Soho W1). Of course, in the familiar fashion, the ground level is completely reconstructed, so there’s little left to suggest its former use. These are just a few buildings in this area which once were pubs. Many more have been demolished to make way for new uses: new shopping centres or stations, new roads or office blocks. The Excelsior, featured at the start of this post, is just another example of this impulse in London to make way for the new by getting rid of what went before. “Architectural” lettering is embedded in the very fabric of the building. It’s often to be found at the top of old pubs. It must be distinguished from “fascia” lettering, which are signs affixed to the facades of buildings, usually advertising the shop or pub name. Dates are taken from F.H.W. Sheppard (ed. ), Survey of London, volumes 33/34 (1966), available online at British History. The reference to these buildings is here. See contemporary reports on BBC News for further information on the background to this. This entry was posted in Pub History and tagged former pubs, historical pubs, soho, w1. Bookmark the permalink. Nice post. Along similar lines, I would suggest taking a look at Jane’s London – http://www.janeslondon.com/ – which has a section on closed / former pubs around London. Yes, she comments on my Flickr photos, and has a very fine website indeed. Amazing how tall some of these buildings are! Would the pubs have had accommodation upstairs, or something else? I suppose it’s possible; I’m not entirely sure. It looks as if some of them may have had extra levels added in subsequent years (I’m looking at the Foyle’s building in particular). What do you suppose it is…people drinking less? Better public transport making people more likely to travel for beer? Oh hi Krista! I enjoy your blog and if I spent more time on my WordPress setup I’d link to loads more great blogs like yours! Sublime post. Would you mind if I copied the idea for Clerkenwell? Sure, go right ahead. I’d be very interested to learn more about the pub history of your neighbourhood. About the Palace Tavern on Charing Cross Road. My great great grandfather, Arthur Robert Cripps, owned the pub when it changed names a little before 1900 I believe. My great grandmother was in-fact born there with several of her siblings! As to the question what were the upper floors used for, I have an account of what it was like living there, written as part of a series of biographies by one of my great great aunts who also, grew up there. I now live not far from you near Brockley. “Arthur decided upon a public house. A boyhood friend, Harry Weeks, had been in the publican line and would go in with him as barman and knew the ropes, his father said. So Dad took over the PALACE TAVERN on Charing Cross Road, engaged a pretty barmaid with copper-coloured hair and started business. Mamma had to help him, of course. There were sandwiches to be cut and light refreshments to be prepared and assistance in the bar when necessary. It was larger then than the same Pub is now, a cinema having been built on part of the site. Dad thought that being in the centre of London was a good thing and put every penny into it. (The Brewers knew it was no good, or it would not have been a ‘free’house). So the family left our nice house in Brockley where Lily, Arthur and I were born, and started life afresh in the heart of London. From what my father has told me, they lived and worked in the rest of the building and only the ground floor was used as the pub. In his book “Life”, Keith Richards tells about the time in May of 1962 when “I went to the Bricklayers Arms, a seedy pub in Soho, for the first rehearsal for what turned out to be the Stones” He talks about meeting piano player Ian Stewart for the first time, and describes the rehearsals that shaped the first days of the greatest rock and roll band ever.